Tangram is a flexible mapping engine, designed for real-time rendering of 2D and 3D maps from vector tiles. Built around OpenStreetMap data, Tangram provides optional control over almost every aspect of the map-making process, including cartography, lighting, and geometry customization. Map styles, data filters, labels, and even graphics card code can be defined in a human-readable and -writable plain-text scene file, and APIs permit direct interactive control of the style. Changing the color is just the beginning; every Tangram map is a 3D scene, so you also can modify lights and cameras. 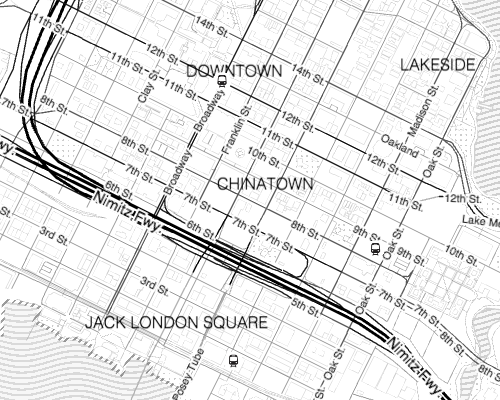 Tangram is designed to use vector data sources such as Nextzen’s free vector tile service, which is a tiled, hosted version of the OpenStreetMap database. Besides points and lines, these data sources contain metadata, which Tangram can use to filter the data and change drawing styles in real time. Tangram is available in two delicious flavors: Tangram JS is a Leaflet plugin for browser-based mapping, and Tangram ES is a C++ library for native mobile and embedded devices. Tangram supports standard map styling conventions, but a Tangram map is also technically a 3D scene. You don't have to know anything about 3D to make a Tangram map, but if you'd like to dig deeper into the unique world of Tangram styles, the Concept Overviews section is a good place to start. Tangram maps are styled using a custom styling syntax inside of a YAML scene file. This file describes a hierarchy of objects which control every aspect of your map, including data sources, feature layers, lights, cameras, textures, and more. The Syntax Reference section of the documentation enumerates and describes the objects allowed in the scene file, and enumerates all of their properties. Specific documentation about implementing Tangram on various platforms is available in the API Reference section. The scene file syntax is platform-independent, and should function the same way everywhere – any exceptions are marked. Note: the documentation always refers to the latest release of Tangram – reverse compatibility of scene file syntax is not guaranteed. A variety of example maps are available at our documentation's Demos and Examples page. Tangram is free and open source, and is available for both commercial and non-commercial purposes. The source code is open to view and modify, and contributions are welcomed. Learn more about the concepts, objects, and parameters of the scene file in the topics in the sidebar. Or, to jump right in, follow this walkthrough to learn how to make a map with Tangram JS.